Conventional Wisdom — use convention and visitors bureaus to your advantage! For those who’ve taken advantage, Convention and Visitors Bureaus (CVB) get high marks as great reunion resources. They are in the business of destination management. CVBs know their city better than anyone; all the ins and outs of the location, hotel room quality, availability, accessibility and the right people to deal with. Local knowledge is a big advantage for CVBs. The purpose of CVBs is to provide reunion organizers local knowledge and efficient management as a benefit of coming to their city. 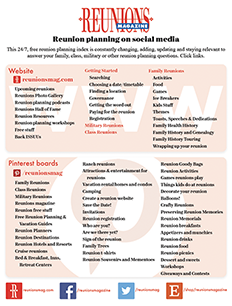 Most CVB services are low- or no-cost to reunions. You are looking for more value and CVBs are looking to expand their market. You win. We learned from an issue of Successful Meetings that many CVBs are going after 50-member meetings (helping find hotel rooms, activities, transportation options). “They’ve become much more alert to small pieces of business,” the article declared. This is excellent news for reunions. Reunion organizers recognize that the value you get in a smaller community could be greater than in a larger city – affordable housing, food and beverages, as well as the ability to customize and create meetings outside the box. Parking in smaller cities is often free, unlike in large cities where a night of parking may add from $7 to $20 per vehicle. Bureaus in many smaller budget cities work with the community, its academic centers and local attractions to develop a special niche. The recent Burney Family Reunion in Junction City, Kansas, where the Geary County CVB provided mailings, maps, brochures, printed name tags and a local tour with transportation. 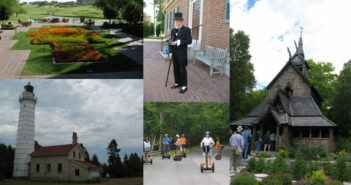 Fort Wayne, Indiana, CVB offers a “Discover Your Roots” package for individuals with special packages for groups. Spend afternoons doing research at the Genealogical Library in the Allen County Public Library. They have over 500,000 documents including census reports, military papers, and Ellis Island logs, resources on CD-ROM and network links to other genealogical libraries across the country.